One of the most common questions I get is about how to teach a baby to use a spoon. Today we’ll talk about the specific things you can do to help your baby learn to use a spoon. In this post I talked about some more passive ways you can teach spoon use. I’ve seen all sorts of recommendations on this. The most common one I’ve seen recommends having your baby start to use a spoon around 12 months. Here’s the thing. Why wait? 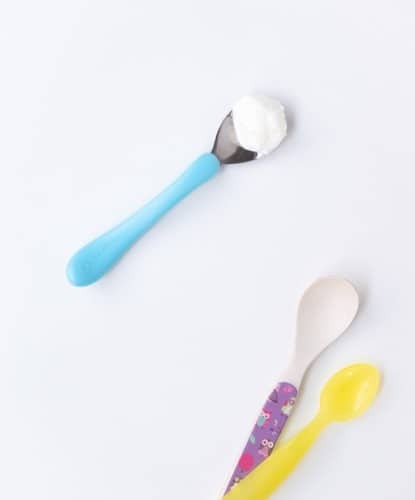 While sure, your baby won’t be able to load their own food onto their spoon for awhile, there is absolutely no reason to wait until 12 months to introduce a spoon. I recommend introducing a spoon a soon as you start introducing solid foods. And then keep exposing your baby to it at least once a day if possible. If you’re feeding purees, it can be a little more difficult to incorporate letting your baby use a spoon in those first few months. I encourage you to also pre-load a spoon and let your baby get it to their own mouth. You don’t have to do this for the whole meal, but do try to do it for as much as you can. For both feeding methods, a great way to keep the feeding moving is to have more than one spoon to pre-load. That way while your baby is working with one spoon you can pre-load another. Often times the second spoon with food can encourage your baby to relinquish the first spoon. 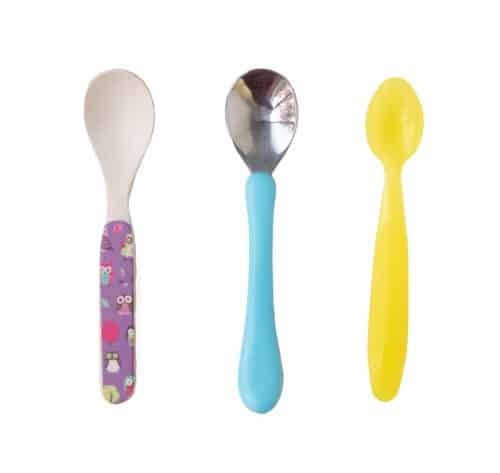 Encouraging sounds when your baby gives you the spoon to load again, or even just let’s the spoon go, can go a long ways towards teaching your baby how to get more food on their spoon and reduce frustration. Using a spoon is a skill that is learned. That means that not all babies will learn it at the same time. Sure, if you give a 15 month old a spoon for the first time, they’ll learn how to use it quicker than a 6 month old. To a point. But not all 15 month olds will have the same skills. So what can you expect when you're teaching your baby to use a spoon? It depends! All babies are different. You could have a precocious baby that picks it up quickly, or one that takes a bit longer. The key is repetition and no pressure. Especially before 14-15ish months when the desire to start scooping things onto the spoon by themselves might become more prominent. If you start at 6 months, expect it to be quite a while before your baby actually gets food on their own spoon. But with some practice, they should be able to get the spoon to their mouth and effectively eat food from it. If you start later, say around 12 months, still expect it to take some time to gain the skills. Allow your baby the time to explore with the spoon and use it how they want at the table. Pre-loading the food is key. By modeling how to use a spoon, you can go a long way in helping this stage. Once your baby starts to express a true desire to scoop their own food with their spoon, you can start to gently use a hand over hand method. Place your hand on top of theirs and guide the spoon as they scoop food. Allow them to handle the spoon themselves once the food is on the spoon. Don’t be surprised if your baby still uses their hands to pick things up, as it is still more efficient for them. At this age there’s really no need to start teaching table manners around this aspect of eating. Continue to let them explore and develop their skills, and wait until much later in the second year of life to start curtailing exploring food with their hands and spoon.